Roosevelt, being Teddy and Franklin Delano… Truman, Kennedy, Johnson, Reagan, Carter, George H. W. Bush, Clinton, George W. Bush, and Obama: that’s the list of presidents who have visited NC State University’s campus. The City of Raleigh has also enjoyed a rich presidential history, being the birthplace of the seventeenth President of the United States, Andrew Johnson, who took office after the assassination of President Abraham Lincoln in 1865. Presidents Andrew Jackson and James Polk were also born in North Carolina, although both were raised and live primarily in other states. 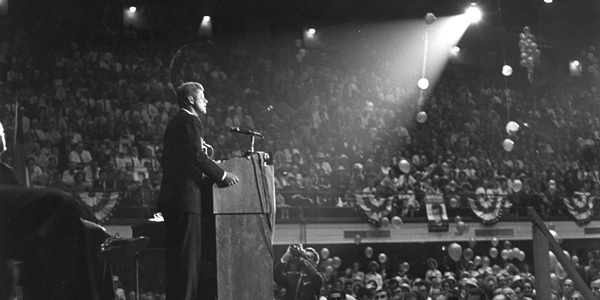 President John F. Kennedy addresses a crowd at Reynolds Coliseum in 1960 (Courtesy of NC State University collection). NC State University is a flagship institution for engineering, the sciences, business, design, humanities, and much more, so it should be no surprise that the institution has hosted so many presidential visits. Moreover, the Triangle is a national leader in innovative technology, modern business, and is among the fastest growing regions in the country, making it a smorgasbord of political ideologies, and solidifying the state as a rapidly changing battleground for national attention, especially during presidential elections. 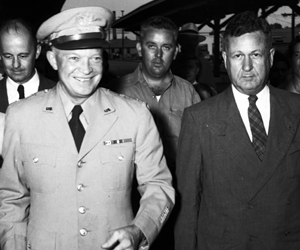 General Dwight Eisenhower visits campus in 1947, alongside Chancellor John Harrelson (Courtesy of NC State University collection). Close to Election Day last year, The Technician, NC State’s leading newspaper, produced a story highlighting the presidential visits of the past. Most recently, former First Lady Michelle Obama visited in October 2016 as a part of the Clinton campaign, and to encourage young people to get out and vote. 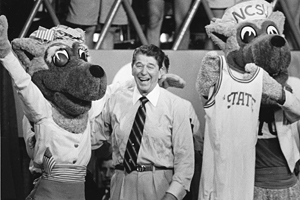 President Ronald Reagan visits NC State in 1985 (Courtesy of NC State University collection). In 2014, Tim Peeler of NC State University also published a brief history of presidential visits to campus, featuring stories from Teddy Roosevelt at the old fairgrounds, to President Obama inside Reynolds Coliseum in 2011. See the full story and accompanied photos here.